More than 5,000 children learned dance from Patricia Schuster, a professional ballet dancer who brought the art of fine dance to Ridgefield in 1965 and whose legacy is alive — and dancing — today. Born in 1937, the Ohio native grew up in New York City, Schuster studied at the American Ballet Theater School and with teachers from the Royal Ballet and the Kirov Ballet. She danced professionally with the Brooklyn Opera Company, the Boris Goldovsky New England Opera Theater, and other companies. 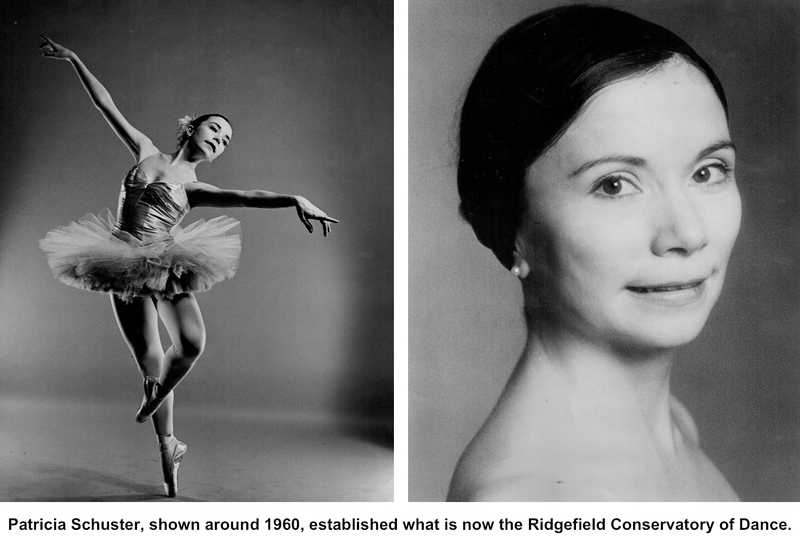 In 1964 she moved to Ridgefield and a year later opened the Patricia Schuster School of Dance in the Community Center. Later, she renamed the school the Ridgefield Studio of Classical Ballet. In 1978 she also founded the Ridgefield Civic Ballet, which staged many productions with local students and international stars. A number of her students have gone on to professional ballet, including James Fayette, who was a leading dancer with the New York City Ballet and is now a director, with his wife, of a school in Los Angeles. Schuster died in 1999 and in May 2000, it was revealed that she had bequeathed her Ridgefield Studio of Classical Ballet to the Friends of the Ridgefield Playhouse, the organization that was renovating the old high school auditorium into a performing arts center. In its early years the Ridgefield Playhouse provided a venue for both classes and performances, and still is a stage for performances under its new management, the Ridgefield Conservatory of Dance. “The Playhouse embraced the school as its dance school in residence and, recognizing that the school needed and deserved its own management structure, acted as a bridge to its new life as a non-profit with its own board and management,” said the Conservatory, which now has its school at 440 Main Street. Schuster’s bequest included funds to support the project.